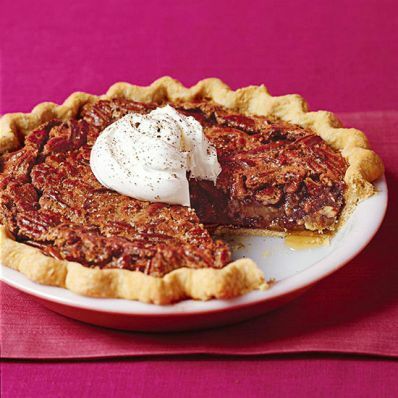 Filled with pecans, this pie recipe will be a sure hit at any gathering. 1 of 3 Heat oven to 350 degrees . 2 of 3 Beat eggs slightly in bowl. Add both kinds of sugar, the corn syrup and vanilla. Stir in pecans. Roll out pastry to a 12-inch circle. Fit into a 9-inch deep-dish pie plate. Decoratively crimp pastry edge; set pie plate on heavy-duty baking sheet. Pour filling into pie shell. 3 of 3 Bake at 350 degrees for 55 minutes, until knife inserted midway between center and rim tests clean. Cool on rack to room temperature. Serve with whipped cream or topping, if desired.